Three years ago, Mr & Mrs Junaidix got hitched in a simple, low cost modest wedding of the year. Sesuai la kan, mengikut Sunnah Nabi. We did not have professional photographer capturing the once-in-a-lifetime moments. We only had a pair of wedding attire each, which was meant for the nikah ceremony. They were not made in Bandung nor Jakarta, but by a Chinese tailor in Wangsa Maju whom a friend of a friend told us was the cheapest tailor in KL. The pinnacle of our simple wedding. We. Printed. Our. Own. Wedding. Card. By. Ourselves. Haji Bakhil would be proud to have us as relatives. Because we are so stingy like Hj Bakhil, our wedding photos were mainly taken by my elder sister who was my wedding make-up artist slash photographer. Kata jimat kos kaannn... Nasib baik kakandaku yang baik hati tak hantar invois lepas tu. Kerana photographer merangkap mak andam perlu amik gambar, pengantin kena touch up diri-sendiri! Of course yours truly was the one who whipped out Photoshop and touch-up2 the photos afterward to make them look yummier and come out straight from a professional studio. After all, if you can't have it, fake it! Muahaha! After the wedding, I posted the photos on my blog and Flickr for the viewing pleasure of our friends who could not make it to our wedding due to the its 'oversea' location. We never gave two hoots about them later. A year passed by. 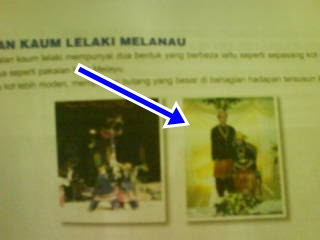 Suddenly we were told that one of our wedding photos appeared in the National Service (NS) textbook! Quick-quick sepantas kilat we checked our email and mailbox, in case we missed seeing the email / mail seeking for our permission to re-publish our wedding photo in a national level text-book. Nada. Nil. Zit. I guessed we were doing a national service of our own by posing for the benefits of national education. Hey, but those kids got paid, why didn't we??? And what happened to Intellectual Property right? What? Tak de IP? Kau tengok betul2 muka siapa yang sakan bersanding dalam gambar tu and tell me that again?? We figured that since it is for educational purpose, therefore we decided to just let the ministry off the hook. Dapat publisiti pahala kan. At least after this if we were caught in khalwat, and forgot to bring our marriage cert, we could always tell them to look up the proof in PLKN textbook. Satu Malaya tahu kami pasangan yang sah ye. So, moral of the story. #1. Just because our wedding is cheapskate wedding of the year, does not mean it won't get national coverage and mengalahkan wedding beratus-ratus ribu ringgit. So get creative, not expensive, uols. #2. Learn Photoshop skills, and you'll save RM3k - can buy a complete bedroom set or pay off 5 months of your rental or even go for a luxurious domestic honeymoon. #3. Watermark your photos, bebeh! Nanti orang suka hati cilok tanpa perasaan kesalahan, walaupun dia kerja dengan kementerian ok! Salam dear. Boleh share tak contact number chinese tailor yang kat wangsa maju tu? Susah benor nak cari org pandai jahit area sini. Tolong yer. Thank you so much.